Do you want to live by faith, yet you feel doubtful and anxious? It feels as if you always lack faith? You seriously want to live by faith, but what you feel and see is totally the opposite of what you believe for. Is that you? Believe me, you are not alone. Everyone agrees that we should live by faith, but how do you do it? I uttered those words many years ago and I wasn’t prepared for the response I was going to get. I got bombarded with all the reasons why I should remain realistic and how I should consider the circumstances around me. To be honest, that response eventually caused me to go silent, but by God’s grace I never gave up on my commitment and conviction about what I believed. I have faced many set-backs and challenges along the way, but I do believe that the time has come to speak out and do what needs to be done. 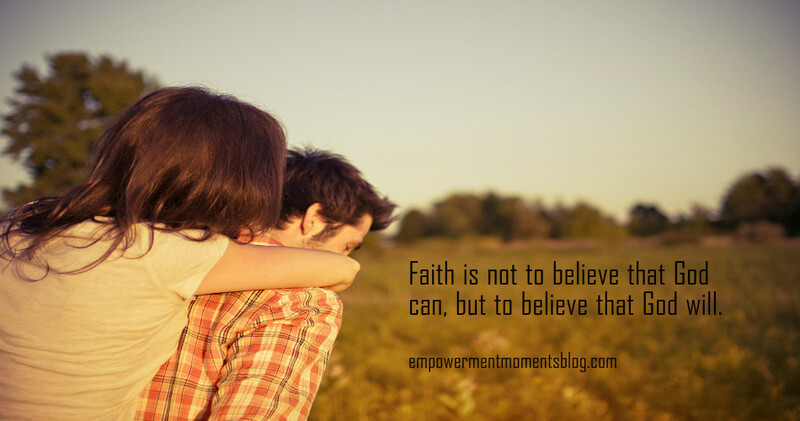 “Have Faith In God”… That’s Easy To Say; But Can You Really Live By Faith? Have faith in God. That is all you need. Sounds easy, doesn’t it? But it’s easier said than done. Yet it remains a reality and it is the way God would love to see us live our lives. When I read Yvonne’s great article – ‘Walk By Faith and Not By Your Emotions’ – I just couldn’t help myself. I had to start writing this article about how it is not only possible, but it’s actually how God wants us to live. Nobody said it’s going to be easy. If it was, we all would have been faith giants. Along the way we will face challenges. Nowhere in the Bible is it documented that Jesus said it would be plain sailing and that we would never have to face any difficulties. No, it is a known fact that we will face trials and temptations. Trials and temptations will come, but it will not be too much for us to handle. By faith we can overcome them all. It might not be easy, but it is possible. God would never expect anything from us if it’s not possible. How can we consider it joy when we are facing trials? Think of it this way; the bigger the trial you face – the bigger the victory will be. See every trial as an opportunity for God to be glorified by showing His power in your life to be victorious once again. God is God, He cannot be defeated. How Can We Develop Our Faith? One of our priorities should be to develop our faith, because it is impossible to please God without faith (Hebrews 11:6). God has distributed faith to each one of us (Romans 12:3). It is now up to us to develop it. We exist here on earth in the physical realm and therefore it is much easier to respond to what we physically see and feel. But in order to develop our faith, we need to make the quality decision to make God’s Word the final authority in our lives. Although God is continuously communicating with us, many people claim that God never speak to them or that they never ‘hear His voice’. The fact is that God will not necessarily speak to you in an audible voice. That ‘small voice’, or ‘inner voice’, or whatever you would like to call it; have you ever thought of acknowledging the possibility of God speaking to you? What about the Bible on your coffee table? As soon as you start reading your Bible, God is speaking to you. What about your local church? In every service God speaks to us through His anointed preachers. What about all the church services on television these days? We often miss the point when we start complaining that we don’t really like the preacher leading the service. We shouldn’t be listening to the man; we should be listening to the voice behind the voice. Have you ever experienced where two people came from the exact same service, yet both got an entirely different message? Each one received a message that was applicable to his / her personal situation. That is the power of listening to the voice behind the voice. Although we experience our existence in the physical and think of ourselves as physical beings, we are actually spiritual beings. We have a soul and we are living in a physical body (1 Thessalonians 5:23; James 2:26). There is an ongoing battle between the flesh and the spirit. Matthew 26:41 (NIV) says “Watch and pray so that you will not fall into temptation. The spirit is willing, but the flesh is weak.” We need to start by praying. We are not able to do anything in our own strength, but with God all things are possible (Matthew 19:26). Do not focus on what you see or feel. Focus on what God’s Word says. Don’t believe people when they tell you that you are a loser; what does God’s Word say about you? Secondly, get confirmation. As mentioned before, the Word of God should be the final authority in our lives. If you sense in your spirit that you need to do (or avoid) something, but you are not sure whether it is from God, test it to what is written in the Bible. If it lines up with the Word of God and you feel at peace with it, you can take that as confirmation. If it is in the least contrary to anything written in the Word of God, it is most definitely not from God. You can often get confirmation in various ways. Without you saying a word, your husband/wife can start talking to you about the exact same thing that came up in your spirit. I often experience it during my Bible-study time. I am subscribed to more than one group that sends me daily messages. At the same time I work through at least one book about faith. Frequently, as I open these messages, I would get confirmation as the one would confirm exactly what the others are saying. Often, as I open the book, it would even be on the same topic as well for that day. Alive to God: The message was based on 1 Corinthians 10:13 – ‘God is faithful, and He will not let you be tempted beyond your strength, but with the temptation will also provide the way of escape, that you may be able to endure it.’ (The theme of the message was based on God’s faithfulness and that He will always provide a way for you). Neil Vermillion: (First sentence)… Even in your frailty, in your weakness, in your limits I am with you even still, for I will never leave you. Can you pick up on the confirmation here….? After getting all this confirmation it becomes easier to make decisions and take action based on your faith. When you then start seeing positive results based on those decisions, you become stronger in your faith. It is not something that happens overnight, but the sooner you start, the sooner you will start growing in your faith. Nothing will happen unless you start doing something about it. Faith Is Less About Talking And More About Doing. Once you’ve made up your mind to walk by faith, it is time to take action. To have faith doesn’t mean you should become passive and that things will start happening as if by some magic. You need to do in the physical what needs to be done, and by faith leave the results in the hands of God. Show me your actions, and I’ll tell you what you believe. Faith without deeds are useless (James 2:14-26). Faith is not about talking. Even spreading the gospel, is not always just about talking. You don’t have to be a preacher to spread the Gospel. You don’t have to walk around ‘Bible-Bashing’ other people either. Without saying a single word, you can live out your faith. Stand by your morals. Set high standards and moral values as you will find them in God’s Word, and live by them, not because you are so smart, but by His grace. Without you saying a word, people will start taking note. They will want what you have. They will want to be blessed – like you – and they will start asking questions. They will start asking you what you are doing and how you are doing it. I have set myself a challenge as a goal for this year. My challenge to myself is to win over negative stress for at least 300 days over a period of one year. I believe this can only be done by the grace of God and it can only be done by faith. I have various daily goals and check-lists to form new habits to achieve this goal. Who is going to join me in this war against negative stress? Are you living by faith? If so, please share more about your victories with us? If you want to become stronger in your faith and you want to live by faith; how do you plan on doing it? Share with us and let’s go on this journey together. 5 Comments on Do You Want To Live By Faith? This is big topic to be posted. In general, I believe it is easy say than done. It is so true particularly for the believers who are facing huge life disappointments. As we grow in the anointing of Holy Spirit, it will become easier and easier but still there is struggle remain. Submit our flesh daily as Paul mentioned. Yet we have almost 700 promises from the Lord. They are useless to anyone until they become the Rhema for us by Holy Spirit. In other word, the close relationship with the Lord is the essential for “live by faith” to be happened. Amen and amen! You are absolutely right when you say to “live by faith” is easier said than done, especially for believers who are facing huge life disappointments. I fully agree with you that a close, personal relationship with the Lord is essential for us to live by faith. I believe it is not only essential, but it is a key principle. Without a personal relationship with the Lord, we may know about the promises, but knowing about them, and living according to them are two different things altogether. In my own life, it was only when I have decided to make God’s Word final authority in my life when I started gowing in a personal relationship with God. I had to decide who I was going to believe; what people are saying, or what God says in His Word. I don’t think we can seperate having a relationship with God and having faith in God. We cannot expect God’s promises to manifest in our lives if we don’t really believe and stand in faith. We have to be convinced in our hearts, it’s not just about talking. We have to know and understand that God loves us and that He cares for us. You have to really trust God, and as you see the first manifestation of a promise of God in your life, your relationship with Him starts growing and you start trusting Him more. As your relationship with Him grows stronger, it becomes easier to trust God and to stand on His promises. As you say, this is when it becomes easier and easier as we grow in the anointing of the Holy Spirit. But as with any relationship, it is not going to happen by itself. We need to take the first step, and then we have to keep working at it. We cannot expect to walk with God for one day, and then start to ignore Him again, yet we expect to be in a close relationship with Him. Thank you for your powerful comment and reminding us about the crucial element of having a close relationship with the Lord if we want to live by faith! Thanks for your valued contribution and for giving us greater insight into the word. The Holy Spirit is indeed necessary for us to live and walk by faith. According to John 16:13 “But when he, the spirit of truth comes, he will guide you into all truth. He will not speak on his own; he will speak only what he hears, and he will tell you what is yet to come.” Jesus had to go so that the Holy Spirit can take up His assignment. The Holy Spirit is there to help us but the question is how many really want the presence of the Holy Spirit to tell us what to do, to guide us and to show us how to live and all that good stuff? Man by his very carnal nature like to be in control and walking by faith involves patience or waiting until whatever it is comes to pass. But then flesh sometimes think that God is taking too long to act, so they take matters into their own hands and make a move without the Holy Spirit. I do agree that this is a big topic to be posted and it is easier said than done. It is a topic that I believe should be explored some more. Absolutely love, love this post expanding further on the previous discussion on walk by faith and not by your emotions. It is easier said than done of course but it will pay off in the end when we step out and step up in faith. We have all been given a measure of it which tells me we all started out at the same level. I believe God expects us to make use of every opportunity that we have to exercise our faith in order to build and strengthen. That is not to say that we don’t all get to a place in our lives where doubt and anxiety put our faith to the test. I agree trials and temptations will come. But we must stand on God’s word to help us and to see us through. I love the application of the scriptures and I think they are perfect to further illustrate what you are saying. One of my favorite is Romans 8:37-38. In all things we are more than conquerors. As we conquer with our faith in God we also see that nothing shall separate us from God’s love. Thank you so much for your positive feedback. I am so glad that you enjoyed this post. I do agree with you; we all start out with the same level of faith. Then it is up to each of us to take responsibility and develop that faith until we become strong in our faith. Nobody starts out with an advantage over anybody else. The beauty is also the fact that God doesn’t expect of you to be a faith giant from the word go, He meets us at our level of faith. We start off being fed with milk like a baby, but as we take responsibility we start growing in our faith until we are strong enough for meat (Hebrews 5:12-14). As you say, nothing shall seperate us from God’s love, and through Him we are more than conquerors in all things.